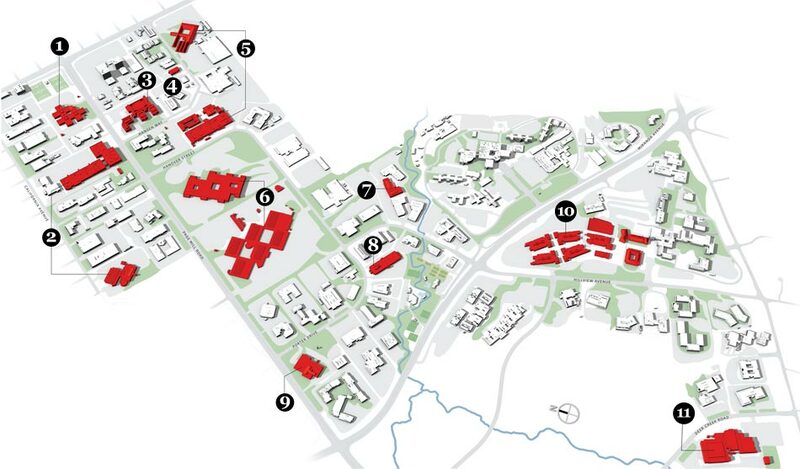 Sixty next year, Stanford Research Park is, more than ever, the innovative heart of Silicon Valley. Just after World War II, Stanford University was struggling financially. It was land-rich but cash-poor, so its leaders had an idea: How about we create a new income source by using some of the land for industry? The park “has changed along with the rest of the valley,” he notes, with three of its newest major tenants — Facebook, Tesla, and Skype — reflecting technology’s evolution. “Startups cluster in downtown Palo Alto, but when they mature and the space needs to grow, the park is the big draw.” Join us for a tour. 1. 650 Page Mill Rd. Home to Wilson Sonsini Goodrich & Rosati, a giant in tech law that advised on Apple’s IPO as well as Google’s. In 2010, Wilson Sonsini did more VC and private-equity deals than any other U.S. law firm. Clients with offices in the park include Tesla, Merrill Lynch, Goldman Sachs, Silicon Valley Bank, and HP — which once had a factory on this site. 2. 1601 California Ave. & 1050 Page Mill Rd. San Francisco firm Studio O+A designed the interiors of Facebook‘s HQ, at 1601 California, to be a physical embodiment of the social network, with open access to execs, lots of gathering spaces, and walls left unfinished to allow for constant redecoration. Facebook also occupies 1050 Page Mill, and a shuttle runs between the two buildings. 3. 955-975 Page Mill Rd. This site was originally home to Eastman Kodak, the park’s second tenant. That building is long gone, replaced by the law firm Foley & Lardner and Nokia‘s newest research center, which focuses largely on experimental wireless projects. Mercedes-Benz‘s North America R&D labs are housed in this squat, red-brick building. The first building in the research park, 611 Hansen Way originally housed Varian, an electronics firm founded by Stanford alums Russell and Sigurd Varian. Built in 1953, it was designed to double as a schoolhouse; if the company failed, the brothers planned to lease the building to the school district. Today, it’s home to Varian spin-off CPI, while Varian occupies a complex down the street. 6. 3000 Hanover St. & 1501 Page Mill Rd. Stanford classmates William Hewlett and David Packard moved their firm to the park in 1956. Over the next two years, HP plans to consolidate all its Silicon Valley staff into its sprawling hilltop HQ here and close its Cupertino campus. Software maker Tibco has long been known for its terrific cafeteria. A fave of research park workers, it offers an especially fine selection of vegetarian options, thanks to Tibco CEO Vivek Ranadivé. Some say Facebook now has the park’s best cafeteria, but Tibco’s is open to the public. Skype will begin moving into its new 90,000-square-foot space this month. CEO Josh Silverman got his MBA at Stanford. 9. 1701 Page Mill Rd. All copies of The Wall Street Journal distributed in Hawaii and California are printed at this plant. The paper has been a tenant since 1964. Software maker VMWare‘s campus, designed by William McDonough + Partners, has won awards for its emphasis on employee health, thanks to its playing fields, lush gardens, and verdant vistas. 11. 3500 Deer Creek Rd. This 23-acre facility will be both corporate HQ and a factory for electric carmaker Tesla, whose CEO, Elon Musk, dropped out of grad school at Stanford after two days. In July, Tesla signed an SUV — development deal with Toyota, which has a research center in the park (on Miranda Avenue). The Tesla building’s north side looks toward the Turchet leasehold, where horses are boarded. Development won’t be allowed on that plot until at least 2025.